"Christmas and New Year is a time to catch up with friends and family and enjoy good food and wine – it is also a time to reflect on the year that has been and 2015 has been a huge year for the Chamber. A new President, a new Executive Director, an international Business Forum, a soon to be new website, a new CSR program, a new sub-Committee structure and an inaugural business survey all on top of ‘business as usual’. None of this would have been possible without the backing of members and sponsors and we thank you for your continued support. We are delighted to announce that AustCham recently passed the 5000 mark on number of attendees at events this year and hope to see this figure grow as we continue to build a strong, connected business community in 2016. In today’s eAdvance, the CSR sub-Committee (Panita Vongkusolkit and Josh Hyland) announce the outcome of the 2015 AustCham CSR fundraising program. Donations will be provided to seven different organisations and recipients invited to share their stories and report on how your fundraising efforts will assist their work. This issue includes the first of these CSR features stories from the Mechai Pattana School. This month we also welcome nine new members to the Chamber and provide you with a ‘sneak peak’ of the final report from the inaugural AustCham Business Survey. Finally, the Chamber Office (Alex, Khun Moo, Khun Yata, Rochelle, Khun Lock, Khun Nong and Khun Boi) wish you and your loved ones a safe and happy Christmas and New Year and look forward to working alongside you in 2016. PS – Tickets to the 2016 Qantas Emirates Great Southern Land Australia Ball are now on sale, book now to secure your spot!" 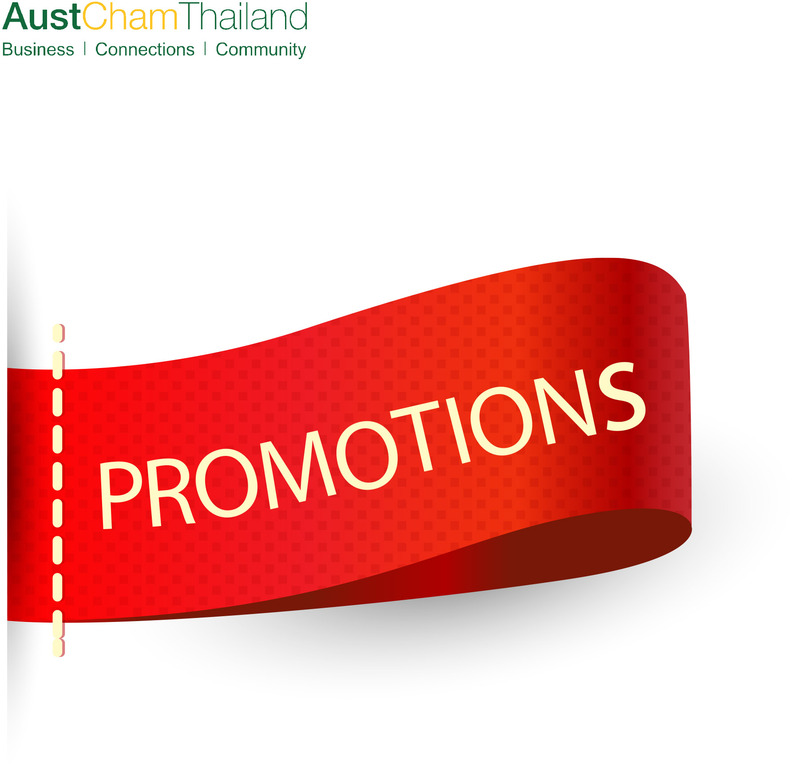 AustCham Thailand, together with the South African-Thai Chamber of Commerce (SATCC) and the New Zealand-Thai Chamber of Commerce (NZTCC), take great pleasure in inviting you to join us for the 10th Annual Barbecue & Braai at Sukhothai Hotel. AustCham invites members and friends to join us for Eastern Seaboard Networking hosted by the South African Thai Chamber of Commerce (SATCC) and held in conjunction with the American Chamber of Commerce in Thailand (AMCHAM), ) the British Chamber of Commerce Thailand (BCCT), the Belgian-Luxembourg/Thai Chamber of Commerce (BeluThai), and the German - Thai Chamber of Commerce (GTCC) at Amari Pattaya. The Australian-Thai Chamber of Commerce is proud to announce tickets are now on sale for the Qantas/Emirates Great Southern Land Australia Ball. Returning to the week of Australia Day, the Australia Ball will showcase the best of Australian food, premium wines and a live band playing Australian favourites. After continued delays the Fed has finally raised interest rates from 0.0-0.25% to 0.25 – 0.50%. This rise is in response to the continuing recovery in the US economy following the GFC. Whilst highly anticipated and prompted by the Fed for over a year, the decision was delayed in the June and September FOMC meetings citing weaker US data, worries about China, and financial market volatility. Strict new rules around foreign property investment in Australia came into effect on 1 December 2015 following the passing of the Government’s Foreign Acquisitions & Takeovers Legislation Amendment Bill 2015. The new rules will apply to foreign persons, being temporary residents and non-residents of Australia. The new Asialink Business website launched on 26 November, provides a one-stop-shop for Australian business looking to improve their knowledge of Asian markets, access market-leading research and attend Asia business-focused training programs and events. Built with extensive stakeholder and targeted consultation, the website addresses specific informational needs for Australian businesses considering Asia. DFDL has made a substantial contribution to the latest Getting The Deal Through – Project Finance 2016 edition, submitting chapters for Cambodia, the Lao PDR, Myanmar, Nepal, Thailand and Vietnam. Getting The Deal Through is the go-to reference on current local legal requirements used by lawyers, investors and industry alike, covering 45 jurisdictions worldwide. A number of DFDL’s partners and legal advisers from each respective office contributed to the publication. TPP: a fair Free Trade Agreement? There's party about to start, to which Thailand has yet to be invited. The party's a big one too: it includes 40% of the global economy. Is it one that will benefit Thailand in a long run though? Mr. Issara Vongkusolkit , chairman of the Thai Chamber of Commerce (TCC), has praised the new team of CEO’s representing 24 large organisations such as PTT, Mitr Phol, Cement Thai, CP and Central Group who will prioritize injecting liquidity into small and medium-sized enterprises (SMEs), the backbone of the Thai economy. Australia has chosen 100 of its brightest undergraduates from 26 universities and awarded them scholarships under the New Colombo Plan. This will give them an opportunity to live, study and work in the Indo-Pacific region for up to 12 months in 2016. On Monday 30 November members of the AustCham and Australian Alumni executive met with representatives from Curtin University to learn more about their MBA Global program. The meeting also provided an opportunity to discuss Australian Alumni objectives and activities. AustCham looks forward to further strengthening our relationship with Curtin University as well as other Australian universities in the new year. This year AustCham members helped the AustCham CSR program raise 250,000THB and for the first time, member feedback was sought via survey to identify which causes would be the recipient of 2015 CSR fundraising efforts. The Mechai Pattana School received a donation of 40,000THB from this year’s AustCham CSR Program. In the attached article, they provide members with an outline of their project and how the 40,000THB donation will be used to assist 10 stateless Burmese students. Earlier this year, members were invited to complete a business survey and provide feedback on business characteristics, growth drivers and current business challenges – the Chamber Office is delighted to provide a sneak peak of the final report in the December eAdvance. All AustCham members will also receive a hard copy of the final publication which will be officially launched in the New Year. Isentia - enterprising people doing things better. Founded in 1982 by Sydney advertising pioneer Neville Jeffress, the company was known until recently as Media Monitors. Not long after opening, and with a vision to reshape the national media intelligence landscape, Mr Jeffress merged Media Monitors with other enterprising Australian companies, founded by Ian Parry-Okeden and Richard Croll. YPB is a provider of covert brand protection and security systems for Brand Owners, OEM’s and government agencies. Our customer solutions combine unique anti-counterfeit technologies delivered in cost effective and easy to use forms wrapped with an effective monitoring framework to help brand owners, their supply chains and consumers deal with the rising tide of counterfeit, pirated and non compliant products. RMA specialises in providing essential products and services to economies in transition. RMA works alongside the development community in emerging and post-conflict markets to build or rebuild local infrastructure - power generation, transport, construction and communications. New Member - CHEP Thailand Ltd.
DFDL established presence in Bangkok in 2005 to better service its growing client base in Thailand, especially related to Thai-based financial institutions and businesses investing in the region. Since then, DFDL has expanded and established distinct real estate, corporate and commercial, energy, mining and infrastructure, tax, labor law, commercial litigation and arbitration practice groups. Anne Matthews is an Australian from Kapunda, South Australia which is located in the Barossa Valley wine district. For the past 20 years she has worked in Italy, London, America and Bangkok in the operations management field. She just relocated from Manhattan New York to Bangkok in November 2015. The Thailand Tigers are responsible for the promotion and growth of Australian Football in Thailand. Our main aim and focus is to attract new players and supporters to our domestic and international games, and to create interest in the AFL in general. Furthermore, the club is committed to building our Thai player base to be able to compete in International tournaments. Ignition Limited HK is a personal investment vehicle that makes direct investments in early stage and ready to commercialize digital media, internet, mobile telecommunication, Biotech and Fintech . Ignition is an active investor and generally invests in companies it beleives it can assist beyond just financial input. Being based in South East Asia and India with deep origins from Australia, investment criteria must include SEA or India expansion ambitions.